Saluted as ‘The Top Brass’, Stuart Turner’s renowned Monsoon range of shower and whole house water pressure boosting pumps continue to be the product of choice for discerning bathroom designers, plumbers and installers across the country. The Stuart Turner Monsoon range is widely recognised for its uncompromising performance, precision engineering and superb reliability. In fact, many experienced plumbers won’t consider supplying and installing any other pump. 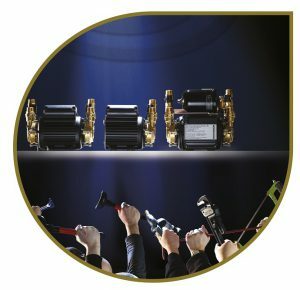 Monsoon brass pumps are still the nation’s favourite brass shower pump, but what makes them stand out above other brass pumps on the market? The working life of a Monsoon pump often stretches well past its normal guarantee period. So much so, Stuart Turner has had the confidence to extend the Monsoon product guarantee to an industry leading five years as standard. There is no longer any need to worry whether the consumer or the installer remembered to register the pump details to get an extra promotional extension to a guarantee. This guarantee extension is now offered as standard with every Monsoon product sold and sets a new benchmark in the industry. The superb reliability of the Monsoon range of pumps allows Hevac to offer an industry leading five-year guarantee as standard. All products within the Monsoon range use ‘peripheral pump technology’ and, as such, they are often considered to be more ‘plumbing system friendly’. For example, they are far less prone to performance and reliability problems caused by the formation of air locks when compared with pumps using ‘centrifugal technology’. At the core of every Monsoon pump is a high performance electric induction motor. These don’t use carbon brushes which wear with use and therefore do not require any maintenance. They are ‘continuously rated’ and offer reliable operation without overheating. Essentially, every pump in the Monsoon range is designed to run 24 hours a day, 7 days a week, 52 weeks a year. In reality, a shower or whole-house pump is never required to do anything like that, but it does mean that a Monsoon pump will go on working reliably for many years to come. Some might call it over-engineered but Stuart Turner calls it ‘Engineered to Excel’. The pump heads and impellers used on all Stuart Turner Monsoon pumps are precision engineered from brass and extended life hard faced seals keep the motor separate from the water in the pump head, resulting in unequalled reliability. The high performance induction motor is rated for continual operation and requires no maintenance. The range includes variants capable of supplying pressures ranging from 1.5 up to 4.5 bar. Single and twin head options make the product suitable for pumping hot and cold water supplies independently or simultaneously, whilst ‘Standard’and ‘Universal’ options are available for use in positive and negative head flow applications. All mechanical pumps will make some noise but minimising just how much noise they make is down to a combination of pump design, application specification, how the unit is installed and the characteristics of the environment in which it is installed. To this end, every Monsoon pump features heavy-duty anti-vibration rubber mounting pads and 300mm long flexible hoses featuring integral isolation valves. These simplify installation and also reduce vibration in the water pipes, making Monsoon pumps amongst the quietest available. In fact, independent testing at Salford University conducted in accordance with BS EN ISO 11203:2009 recorded a noise level of just 52.5 dBA – about the same noise level as a typical dishwasher. As with all Stuart Turner pumps, Monsoon products offer tried and tested engineering designed and built to the highest standards of quality, innovation and reliability. As a renowned British manufacturer, Stuart Turner’s engineering excellence has earned it a market leading reputation both in the UK and internationally. When you choose a Stuart Turner pump you can be confident you are investing in a name you can trust to deliver quality, reliability, design innovation and industry-leading service. Stuart Turner offers an extensive range of pump solutions for low water pressure problems, waste water removal and water boosting across a broad spectrum of applications. You can enjoy all these benefits and more by purchasing your Stuart Turner pumps at Hevac. A race to the bottom?